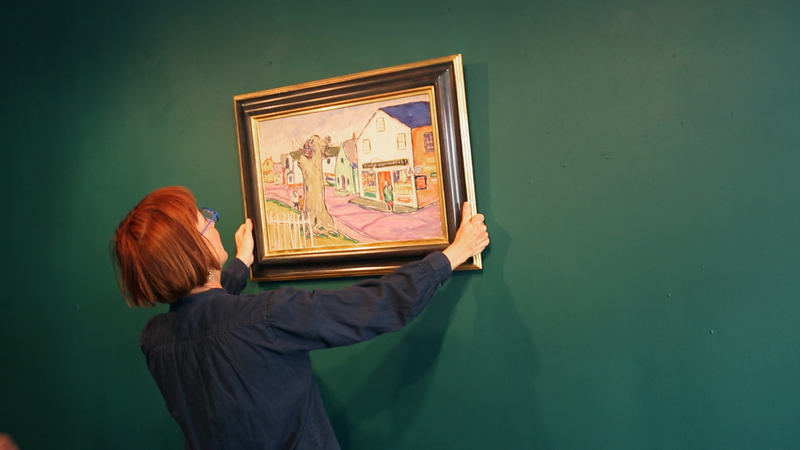 Jane Anderson returned her great-aunt Edith’s artwork to the Provincetown, Mass., art community where she painted it a century before. From PACKED IN A TRUNK. Photo courtesy HBO. It wasn’t easy living in America, circa 1924, if you were a woman with exceptional artistic talent, showed signs of emotional fragility and unorthodox sexual proclivities. Without a supportive family or like-minded community (the ex-pats in Paris, for example) to protect you and nurture your talent, you were an easy target for nervous Nellies and ruthless opportunists who were only too eager to stifle your rogue spirit. Such was the case with artist Edith Lake Wilkinson (1868-1957), the great-aunt of Emmy® Award-winning screenwriter, director/producer, playwright and artist Jane Anderson. Anderson’s eclectic dramatic credits run the gamut from The Positively True Adventures of the Alleged Texas Cheerleader-Murdering Mom (as executive producer and co-writer) to her most recent Emmy® winner, Olive Kitteridge (as executive producer and screenwriter). Her new documentary, Packed in a Trunk: The Lost Art of Edith Lake Wilkinson, debuts tonight, Monday, July 20, 2015, on HBO, 9:00-10:30 p.m. ET/PT. Check listings for additional HBO playdates in July, as well as availability via HBO On Demand and HBO Go. Jane Anderson never met her great-aunt in person–Edith Lake Wilkinson died alone and forgotten in a state mental asylum in Wheeling, West Virginia. 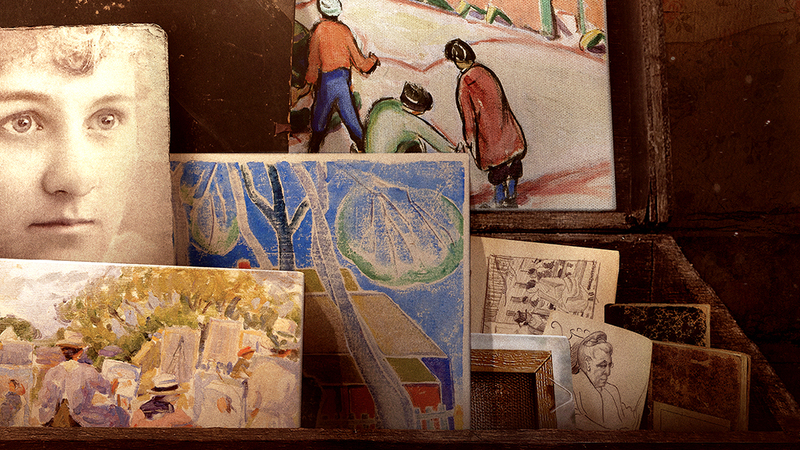 But Anderson grew up surrounded and captivated by Edith’s artwork: Anderson’s mom stumbled upon trunks filled with Edith’s paintings and drawings in a family member’s attic. Daughter Jane credits this artwork, subsequently hung on her childhood walls, with the blossoming of her own creative spirit and evolution as a fine artist, as well as her coming out as a lesbian. 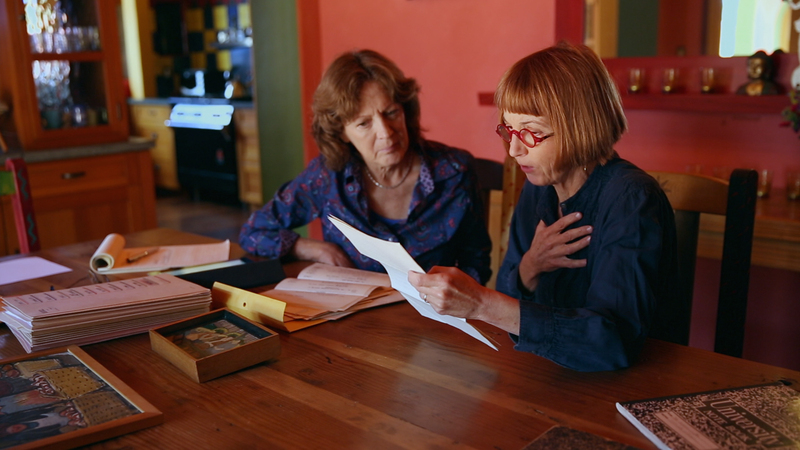 Jane Anderson (right) and her spouse, producer Tess Ayers, search for clues to great-aunt Edith Wilkinson’s back story in PACKED IN A TRUNK. Photo courtesy HBO. To honor her muse, Anderson has dedicated more than 35 years of her life to fill in the sizable gaps in Edith’s personal back story, solve the mystery of her confinement and, most especially, draw wide attention to her exquisite artwork. Anderson takes center stage in Packed in a Trunk, which she produced and co-wrote with director Michelle Boyaner. The film and a companion Website document Anderson’s exhaustive efforts to bring her great-aunt’s sizable legacy out of the shadows and into the sunlight, a feature that Edith so loved to explore a century ago in her paintings and portraits. At 19 years of age, Edith bravely snubbed convention and left her home in West Virginia to settle in New York City where she studied at the Art Students’ League and earned a degree at Columbia University. She met and mingled with noted artists of the day, including William Merritt Chase, and moved in with a woman named Fannie who would become her longtime companion. Edith also ventured to Europe and often to Provincetown, Mass., where she summered, painted and studied with like-minded talents. 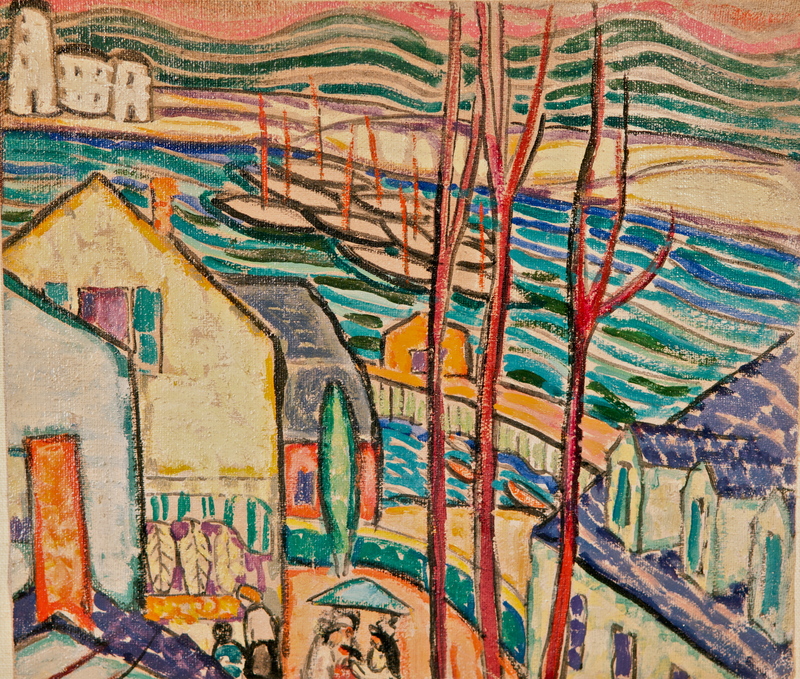 As revealed in her paintings, sketches and innovative block prints, Edith’s life at that time seemed to be filled with joyful exploration and promise. Artwork by Edith Lake Wilkinson. Photo courtesy HBO. Sadly, by the time she turned 57 in 1924, Edith’s plans to sail to Paris after her parents’ sudden death were derailed by her family’s estate lawyer. While systematically embezzling her inheritance, he managed to secure her hospitalization in several mental asylums, where she eventually died, artless and forgotten at 89. Her artwork and possessions ended up in her nephew’s attic until Jane Anderson’s mother found them. Packed in a Trunk casts Jane Anderson as an eager, sincere and adventurous sleuth, and brings her great-aunt’s artwork and sexuality out of the closet with some degree of closure. While she essentially shares a common bond with the filmmakers of Finding Vivian Maier https://judithtrojan.com/2014/04/04 and Living with Lincoln https://judithtrojan.com/2015/04/13 , Anderson’s personal issues and energy at times tend to eclipse Edith, her artwork and milieu. Anderson seems to have found her most revealing resource in the dusty records, memories and warm welcome she received from the artistic community in Provincetown, Massachusetts. Some of the most fascinating sequences in the film cover the history (via personal reminiscence, period footage and photos) of the Provincetown art and gay community. Jane Anderson (right) and her spouse, Tess Ayers, at Edith Lake Wilkinson’s graveside. Photo courtesy HBO. Packed in a Trunk leaves unanswered questions regarding Edith’s family history and back story (her lovers, her actual importance in the Provincetown art community, the reasons for her institutionalization); and the questions that are answered raise even more questions. Late in the film, Anderson telescopes her frustration by visiting psychic Lisa Williams, who supposedly connects instantly with Edith and Fannie, who, in turn, have a lot “to say” from the great beyond. This entry was posted in Art, Cable, Film and tagged Art & Artists, Artist's Colony, Edith Lake Wilkinson, HBO, Jane Anderson, Lesbianism, Mental Illness, Michelle Boyaner, Packed in a Trunk, Provincetown, Tess Ayers, Women's Studies. Bookmark the permalink. I watched this on HBO and found your review to be right on target. I would have liked to know more about what happened to the rest of Edith’s estate and where her paintings are currently (in private hands, museums, galleries, etc. I found Jane to be somewhat childlike in her approach to this project and I wonder if Edith had a similar personality.